Holiday home la Neuville-aux-Joûtes is located in La Neuville-aux-Joûtes and offers water sports facilities and barbecue facilities. This property has a terrace and free WiFi. The vacation home has a TV and 4 bedrooms. The vacation home also comes with a well-equipped kitchen and a bathroom with a shower. There's a garden at this property and guests can go horse riding nearby. Charleville-Mézières is 26 miles from the vacation home, while Chimay is 13 miles from the property. When would you like to stay at Holiday home la Neuville-aux-Joûtes? This holiday home features a barbecue, tumble dryer and washing machine. Would you like to go into nature, take part in sports, enjoy French Burgundian life and at the same time don't want to drive too far? 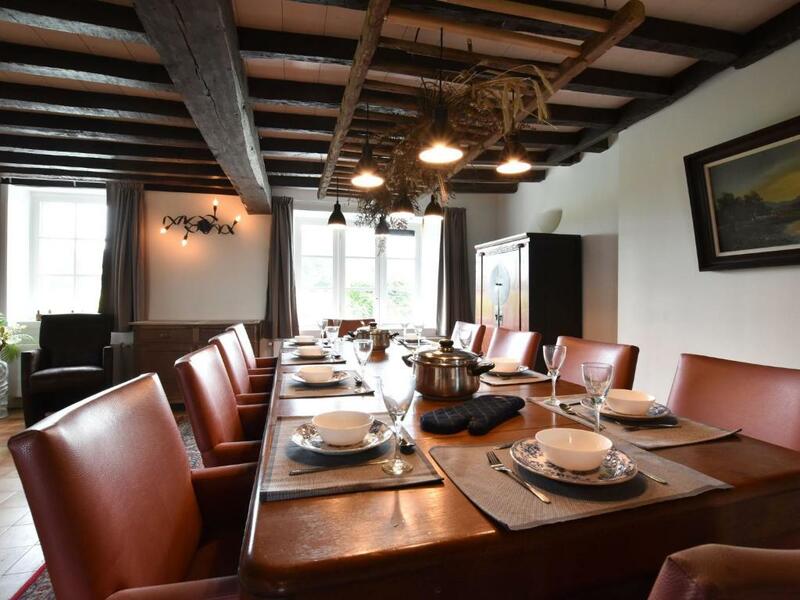 We are pleased to welcome you to this completely renovated holiday home in Neuville-aux-Joûtes (Signy-le-Petit) in the beautiful French Ardennes. Just 7 km from the Belgian border is this wonderfully spacious house where the past 4 years, extremely friendly Dutch owners have poured their heart and soul into turning this authentic farm into a beautiful spacious home. A perfect balance of modern and authentic elements can be found here in every room. The house has character and is very inviting for families, friends and/or groups. 4 adult bedrooms, 2 bathrooms, a large kitchen and a very spacious dining room and separate sitting area. Quality and taste are of paramount importance to the homeowners. The house can also be booked for 12 people under a different house code. This gives you access to an outbuilding (attached to this house, cannot be rented separately) where there is an extra bedroom, kitchen, bathroom and living room. You can fully enjoy yourself in privacy in the wide sun-drenched garden with several terraces. From home, there are 4 beautiful hiking trails (+- 12 km long) and several cycling routes (also suitable for MTB). Only 4 km away you will find Signy-le-Petit, a centre where you can go for all your purchases and a cosy restaurant. There are also several natural swimming ponds in the vicinity such as Etang de la Motte (6 km), Etang de la Vieille Forgé (4 km) and Ponds Cendron (7 km). Here you can swim, walk, but there is also excellent fishing (permit available in Signy-le-Petit). A visit to the Blangy waterfall (21 km) is also worthwhile. You can also go horseback riding in the immediate vicinity and even take your horse and stables (La Croix Colas, 3 km). You can also try a taste of the local Trappist beers in the Abbey Notre-Dame de Scourmont of Chimay (14 km) and Signy-l'Abbaye (34 km), it's worth the time. La Neuville-aux-Joûtes is located exactly halfway between Charleroi (Belgium) and Reims (France), + - 80 km. Lovely cities to absorb some culture or to spend a day shopping. A day trip to explore the Champagne region is also worthwhile. In short, whether you are going for a weekend or two weeks, there are countless possibilities! House Rules Holiday home la Neuville-aux-Joûtes takes special requests – add in the next step! Holiday home la Neuville-aux-Joûtes accepts these cards and reserves the right to temporarily hold an amount prior to arrival. We need at least 5 reviews before we can calculate a review score. If you book and review your stay, you can help Holiday home la Neuville-aux-Joûtes meet this goal.